Baan Samran - A good value property offers you all comfort need to live a relaxing and fulfilling life. A beautiful swimming pool, sun deck to lounge around will make you feel HOME. A good community, geared towards those who appreciate getting a good value. Here require thing to be long lasting. 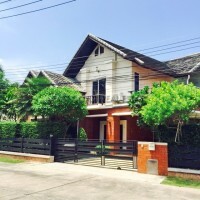 The villa mix Thai lifestyle and European style, this is suite to people who like quiet place to live near many activities. The property consist 3 bedroom 4 bathrooms. This beautiful home designed spacious layout and hight specification that will satisfy everyone. Living area open toward to swimming pool. A dining area, European kitchen is quite combination designed.